KAY KENDALL talks Jane Eyre, Nancy Drew, and Champagne + DOUBLE GIVEAWAY! Today we welcome a fellow debut novelist, Kay Kendall, author of DESOLATION ROW! I (Deb Lisa) met Kay last year at a mystery conference called Bouchercon. Kay is a sparkly, feisty Texan with a big heart. What I loved best about her was her surprise and delight when I told her I’d not only heard of Desolation Row, but had already read it! In Desolation Row, Kay uses the social chaos of the Vietnam War to illuminate reluctant courage and desperate love. Her heroine Austin Starr turns into an amateur sleuth, motivated by reading too many Nancy Drew tales. After all, someone has to get her young husband David released from jail. The time—1968. The place—Toronto, Canada, where the Mounties are sure David murdered a US Senator’s son. Kay’s next mystery, Rainy Day Women (2015) finds amateur sleuth Austin Starr proving her best friend didn’t murder women’s liberation activists in Seattle and Vancouver. 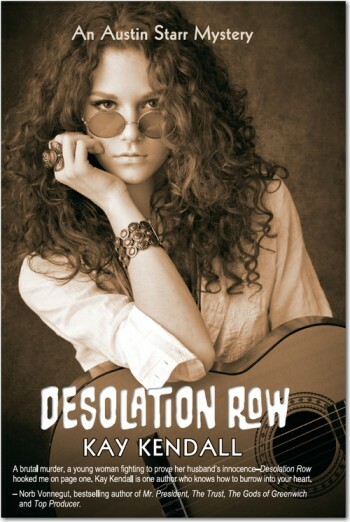 Kay is giving away TWO copies Desolation Row, a trade paperback and an e-book. See details below. Kay took our Deb interview. Welcome, Kay! Thanks for being here, Kay. Please tell us about one book that made an impact on you. My favorite novel of all time—first read when I was twelve—is Jane Eyre by Charlotte Brontë. I rarely re-read books (my motto is “so many books, so little time”), but Jane Eyre is the exception. I’ve read it five times and watch every film version available. Originally I had no idea why this novel appealed to me while another Brontë sister’s equally famous Wuthering Heights did nothing for me. However, now I understand. Even in my early teen years, I was subconsciously drawn to the themes of Jane Eyre—feminism, social inequality, moral justice, religious concerns (of atonement and forgiveness), and family. I’m amazed that even today, this important book by Charlotte Brontë still tallies with my own views. Plus, it’s a danged fine yarn. For me there is no more thrilling line in all literature than the one that begins the final chapter—“Reader, I married him.” Jane, who had sought only to marry her equal, had finally drawn even with Mr. Rochester. Besides Jane Eyre, who is one of your favorite (fictional or non-fictional) characters? Although this may be a cliché, I must site Nancy Drew. I doted on her mysteries, reading every one. Yet, on the other hand, there were other series for girls that I disliked. I only read one Cherry Ames book and quit. Clearly, I was not cut out to be a nurse, not of any kind, since that heroine filled every nursing role possible. No, I loved solving mysteries and I loved Nancy’s independence in doing so. Some reviewers of Desolation Row have compared my Austin Starr to Nancy Drew. That thrills and pleases me no end. Once you are a published writer you must hit the marketing trail…Facebook, Twitter, your blog, your webpage, and other parts of the internet world. This is super time-consuming, and if you skip these steps, your sales will languish and your publisher will not be happy with you. For those writers who are true introverts, living in this new world is torture. As for me, I love the networking and marketing and meeting readers so much that it’s easy to forget about the writing at the core of it all…which remains sitting alone in your writing lair and facing an empty screen and throwing type up on it. For me, that is torture. Once I get past the first draft, then the rest is glorious, even revisions. I’m having the time of my life meeting famous authors and communicating with readers. It is heartwarming and encouraging to be treated nicely by one’s literary heroes. Likewise, there’s nothing more satisfying than when readers tell me that my book means a lot to them. Meeting readers and other authors is a great perk! Have you ever met someone you idolized? What was it like? P.D. James was the first author I met on book tour. Twenty years ago on a rainy Sunday afternoon, I drove ten miles to a Borders bookstore in Houston to have this iconic mystery writer sign my copy of her latest book, Original Sin. When her plane from England was delayed by storms, the bookstore staff said she would rush to the store as soon as her plane landed. So, we all waited. Five of us stayed until, two hours later, she arrived. The wait was worth it. She was graciousness itself, and that memory has enriched my reading experience of her novels since then. Now, P.D. James is Baroness James of Holland Park and a life peer of the British House of Lords. She turns 94 next week and is still writing books. What an inspiration. Now for the serious stuff: If you were a drink (preferably alcoholic), what would you be and why? I would be Champagne. I love the stuff. It doesn’t even have to be from France—as long as it’s a sparkling wine that tastes good. The festivity of celebrating with Champagne appeals to me, and the memory of my first glassful is a treasure. Believe it or not, I was a college student at a summer Russian language institute in the old Soviet Union when I was served quantities of sparkling wine—called champanskoye—from the Soviet region of Georgia. I loved it immediately and have been drinking it ever since. The Russians taught me that Champagne can be enjoyed with any food, from appetizers right through dessert. I will drink to that! Readers, what are some of the books and characters that have impacted you over the years? GIVEAWAY! Comment on this post by noon EST on Friday, August 1st, to enter the giveaway for Desolation Row. Kay is giving away a trade paperback and an e-book to two lucky winners! US, Canada, and UK welcome! Follow The Debutante Ball on Facebook and Twitter for extra entries—just mention that you did so in your comments. We’ll choose and contact the winner on Friday. Good luck! Kay Kendall’s debut mystery came out in 2013, Desolation Row—An Austin Starr Mystery. The sequel, Rainy Day Women, comes out in spring 2015. 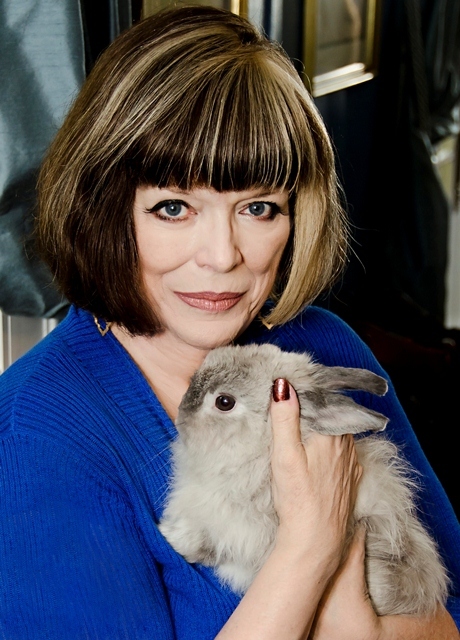 Kay is an award-winning international PR executive living in Texas with her Canadian husband, three house rabbits, and spaniel Wills. Terribly allergic to bunnies, she loves them anyway! Her book titles show she’s a Bob Dylan buff too. Don’t enter me into the contest b/c I already own a copy of DESOLATION ROW. It’s on the top of my TBR and this post by lovely Kay is a terrific hint that I really must spend this afternoon sitting in the yard and reading her book. As a fellow introverted writer who can’t stand publicizing my own work, the one silver lining about social media has been meeting wonderful authors like Kay (and the various Debs). Raising a glass of champagne to Jane Eyre, Nancy Drew and YOU, Kay! Thank you, Julie! I do so hope you enjoy Desolation Row! You’ll know if Ontario feels familiar, but it was before you were born, but mayhap you will see connections. Thanks so much for your friendship and support. I think social media is fab! Otherwise I might never have met you. Folks, her debut novel is out on SEPT 9–Five Days More. Pre-order your copy now. It bodes to be a Very Big Book! I also already own a copy. Great post, Kay! I too am a huge Jane Eyre fan and can’t count how many times I’ve read it. It’s the first and greatest romantic suspense novel, as well as a remarkable work of feminism for its time. Do you also like Middlemarch? Hi there, Lynne! True confession time. I’ve never read Middlemarch, only seen the TV version on PBS…for shame. I’ve read about it since and know the themes. Guess I need to add it to my TBR mountain, gulp. Thank you so much for your friendship and support. Folks, she has TWO mysteries out. They are both whip-smart and complex. Dante’s Wood + Dante’s Poison. I love it when bloggers I follow guest blog at other blogs I follow. Besides being a faithful follower of Debutante Ball, I read the Stiletto Gang blog and enjoy your posts very much, Kay. Would love to win a copy of your book! The novels which have impacted me over the years: To Kill a Mockingbird, Atticus Finch who is a man with integrity, principles and values which are important and admirable. Rebecca since it is very intriguing to realize what lurks out there in the hearts of men and women. Anne of Green Gables since Anne is determined, strong minded and a unique woman especially for that era. Jane Eyre is also one of my unforgettable novels which was captivating. I read all of the Nancy Drew mysteries when I lived in Canada. Love those Mounties. Best wishes and much success. Your novel sounds enthralling. I need a writing lair, that much is clear. Thanks for posting with us, Kay! Posting with you Debs is my pleasure, Lori. As to writing lairs, mine is the same ole room that has gone by different names. First it was the guest room (but tripled as basement storage and home of the treadmill, which stayed consistent under all the other names), then the writing room, next author’s room (after I was published), and lately I’ve said writer’s lair. It sounds so much more idyllic. Basically it is a happy hovel. I crawl past the heaps of un-stored stuff, past the treadmill (used occasionally) plunk myself in the chair, and everything else in the room goes away except for my PC screen. Nuclear war could go on around me, and I wouldn’t notice. Hi, Marcy. The Nancy Drew books I read were the original versions in slightly redone covers. I was always puzzled about a few things that were always found in them that I never encountered in my life. What was a roadster, for example? I figured out it was a car, but why didn’t anyone talk about it? I had no idea that the books were written decades earlier. Thank you for your interest in my own mysteries, and I hope you enjoy them. Thanks for being a guest here at The Ball, Kay. I’m looking forward to reading your book. It sounds fabulous! Thanks so much, Deb Heather. I hope you enjoy reading Desolation Row. Your enthusiasm for Jane Eyre is similar to how I feel about Les Miserables (I’ve seen the show, seen the movie, watched the concert DVDs, listened to the Orson Welles radio adaptation, and am now reading the book). I have no interest in other Broadway shows at all (despite what Amazon thinks 🙂 ). It’s interesting that you mention Nancy Drew. I’ve just been reading a collection of very early mysteries with female detectives, and I’ve learned that both the “spinster detective” and “girl detective” types were created by a woman named Anna Katharine Green, who was writing mystery stories before Arthur Conan Doyle. Plus, based on what I’ve read so far, she was really good. Anthony, that’s very interesting about the pre-Sherlock female author. Her name was new to me. As to Les Miz, if I play a cast album, I have to play it for days…so addictive! another champagne fan here… welcome to the ball! Kay! A little late, but want to say thank you for joining us! See you soon! Thank you, Debs Heather and Lisa! This is a great place to visit, talking books and such. I appreciate your invitation. See you three weeks from tomorrow for Killer Nashville, Lisa! YAY!